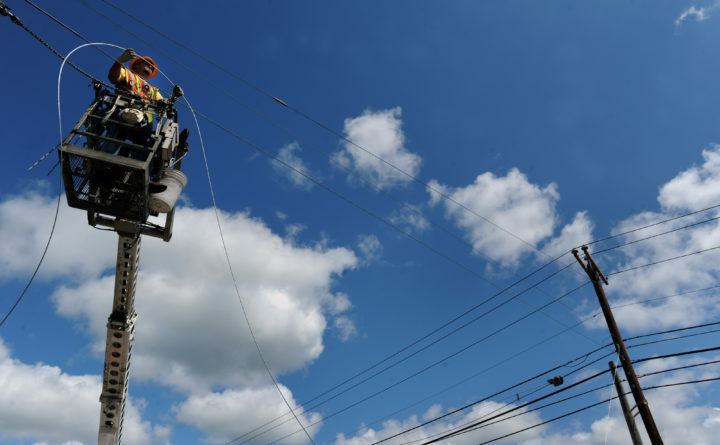 A worker installs a guy wire on a utility pole while his crew lashes fiber-optic cable on a support strand wire along River Road in Bucksport, July 28, 2011. Maine has named a new executive director to lead efforts to expand broadband across the rural state. Department of Economic and Community Development Commissioner Heather Johnson has named former small-business advocate Peggy Schaffer to lead the ConnectME Authority. Democratic Gov. Janet Mills has pledged to expand broadband access and stimulate the economy with targeted grants and loans. She’s also promised to empower the ConnectMe Authority with more responsibility and allow the creation of broadband expansion districts. Maine’s State Chamber of Commerce last year called for $100 million in annual state investment to expand broadband access across the state. A Thursday press release said Schaffer formerly served as co-chair of the Maine Broadband Coalition.